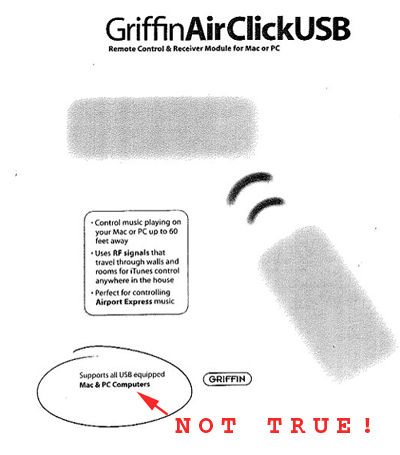 The packaging for Griffin Technology’s AirClickUSB clearly states that the product “works on any mac or PC with a USB port” (see picture).This would make sense because the device is basically emulating a USB keyboard with its volume, arrow and clicker to control powerpoint or iTunes. Perfect – hardly? Once you get the AirClick USB home and open up the instruction manual, you learn that you actually need the OSX or XP operating system to use the product. Even though that’s not the same as “All USB Equipped Computers” like it said on the box, who cares since my powerbook has been crash free and content with OSX (10.2) for more than two years. Installing the software on my powerbook, I encountered no problems, and no additional compatibility requirements are mentioned. However the software/hardware doesn’t function at all. The clicker does nothing and opening the software is completely useless – nothing happens. Literally nothing. Its as if the Air Click USB doesn’t even exist. A call to Griffin Technology’s tech support line yields the information that the AirClickUSB only works with “10.3 or greater”. 10.3 or greater?!? The packaging and instructions clearly state otherwise, and anyone who doesn’t meet this criteria (most home computer users) is out $49.99! What a crock! Now, Griffin has been around for years. They are a big company with many products. Most companies let you know about the system requirements BEFORE you buy their products, nevermind get to the point where you are calling tech support. However, for some reason Griffin has chosen to provide zero functionality and no clue that they are wasting their money to consumers who have managed to avoid the pitfall of continually paying big $$ to upgrade upgrade their computer and OS every time Steve Jobs and Bill Gates tells you to. (Wait Ð it turns out thatÕs a majority of home computer users – still happily running windows 2000 etc.!) And like most reasonable people, I will not shell out $100+ for a whole new operating system just to slow down my computer, and make programs stop working. Even if it means that the AirClickUSB might function as discribed. Phooey! For the record, I had excellent experience with Griffin graphics products in the 90’s. Sorry to say that that experience has not continued today.